If you live in a town that doesn’t consider pedestrian safety a very high priority, the signs are probably pretty obvious if you spend any time walking. How can you tell that a city prioritizes vehicles over pedestrians? Clovis might be revealing their hand with this absurd level of incompetence. In the past two years, they’ve added well over ten miles of lanes in widened roads, installed and began operating multiple new stop lights, and resurfaced various streets. And yet they can’t quite finish a single crosswalk that connects an elementary school, a church, and two residential neighborhoods. I guess the safety of children is no one near as important as adding new lanes in rarely used places. You might remember back in April of 2012, when I looked at the slow construction. A year ago, in June of 2013, I went back and saw that the safety component of the project — the lights embedded in the pavement — had still not been activated. Here we are in June of 2014 and it’s still not done. 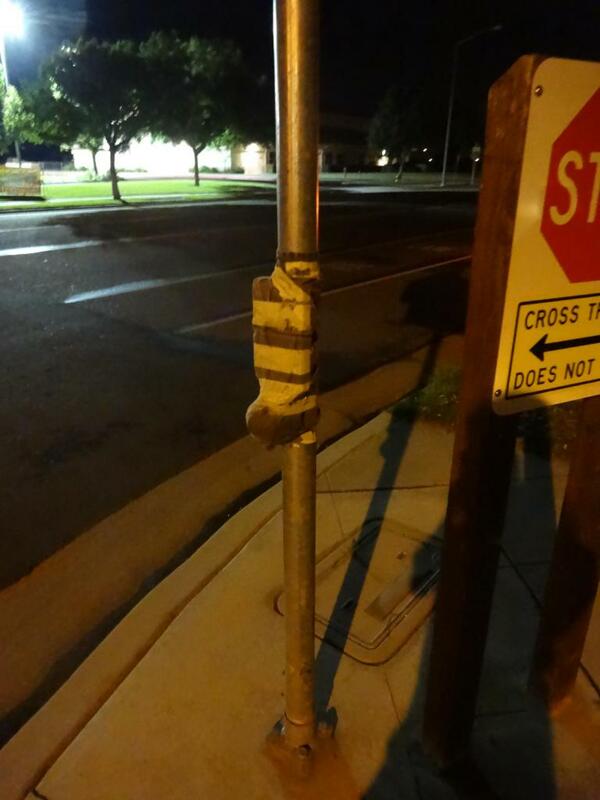 To add insult to injury, while the other four crosswalks with lighting in Clovis are automated, this one requires pushing a button, which has never been uncovered. Got a story like that from your city? Tell us about it in the comments. Elsewhere on the Network today: The Dallas Morning News’ Transportation Blog discusses the tension in balancing regional and local concerns for transportation projects. Commute by Bike sympathizes with cyclists who break the rules. And Vibrant Bay Area considers what street grid patterns tell us about a city’s history. A multi-phased experiment in St. Paul increased driver yielding to pedestrians from 32 to more than 70 percent. And it decreased unsafe passing of yielding cars 10 fold.